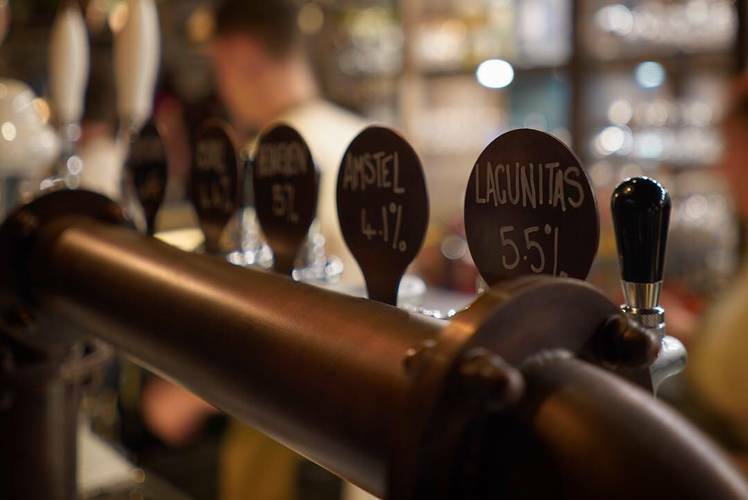 With the growing popularity of beers and ales, beer connoisseurs are offering their advice on the huge variety of beers now available from all over the world. At NWTC, we support those who want to become specialists in this area through our beer qualification, Master of Beers. To get a real insight into the world of beer and brewing - we’ve asked our beer gurus from across all NWTC sites to tell us more about their passion for beer and why we should love it too! First, we introduce New World’s leading 'Master of Beer' our Beer Guru, Lauren Soderberg - who plays a hugely important role when it comes to the beer menus at NWTC. Favourite beer on our menu: Lindemans Cuvee Rene. Favourite beer not on our menu: A very hard question to answer, but recently I had an espresso Barrel Aged stout by Squawk in Manchester that was amazing! What do we need to know about beer? Beer is increasingly being seen as a fashionable drink. My story is all about how the beer industry has similarities to the fashion industry in so many ways! What made you choose to talk about beer and fashion? I love beer, and I may not always look like it, but I love fashion too! I wanted to indulge in both of my passions and I even managed to get in a quote by my favourite designer Vivienne Westwood! At first glance, you may struggle to see exactly what brings beer and fashion together. Much like fashion, beer provides pleasure for many people around the world, and Vivienne is right; these things that give us pleasure should be done well: Beer is no exception. Fashion changes with the times, and so does beer. Peoples tastes change and so has the flavour of beer. From advances in the industrial revolution - meaning products could be mass produced, cheaply - to the influence of travel, music and art - like the fashion industry, beer has seen a surge in all things new and exciting: hence the popularity of craft and world beers. It is widely believed that that beer was first brewed nearly 10,000 years ago, when groups of people decided to settle, rather than migrating seasonally. One of the first things settlers did was plant crops such as wheat and barley. When ground down and added to water, these cereals provided the base for bread, porridge and something even more exciting: beer. Brewing may have started in the home, but it became more established in the monasteries during the 9th - 12th century. Today, very few beers are still brewed by monks. Those that do are known as Trappist beers. In the 14th century, it was women who brewed from their homes, and by the 16th-century the demand was increasing so much that beer had to be brewed on a larger commercial scale. This is when brewing became a recognised profession. The 18th century saw the start of the industrial revolution, a time of technological advancement and invention - allowing goods to be produced cheaper and on mass. In the textile industry, machines like The Flying Shuttle and Spinning Jenny lead to mass-produced woven fabrics. For brewers, the industrial revolution meant more control over the beer they were brewing and the invention of the hydrometer transformed how beer was brewed. It measured beers specific gravity and allowed brewers to calculate the fermentable material yield from different malts. This, in turn, helped brewers to make more cost-effective beer. In 1857 Louis Pasteur discovered the roles of microorganisms in fermentation. Later, he discovered that by heating beer you could kill the vast majority of bacteria that causes beer to spoil. He called it pasteurisation and this meant beer could keep for much longer, allowing it to be transported over larger distances. Pasteurisation is still widely used today. In the late 19th century, Britain was known as, “The workshop of the world” as it played such an integral part if the industrial revolution. Manchester was especially important in the production and export of textiles. The first locomotive was used in 1830, which ran between Manchester and Liverpool and soon more transport links were opened across Europe and the United States - which meant that beer and textile producers around the world could distribute their products to all corners of the globe. Different countries had their own styles of beers - from English milds, Belgian Witbeirs, German Pilsners to American pale ales - so manufacturers were inspired by new flavours and techniques from other cultures. That’s why today, beer is still influenced by cultural styles from around the world. For example, British brewer Camden Town put their own twist on the Belgian-style Witbier, with their Gentleman’s Wit. A beer - originally brewed as a one-off - has become part of their main line of beers. West brewery in Scotland have gone a step further - brewing all their beers in accordance with the Reinheitsgebot; the German brewing purity law. The Reinheitsgebot states that beer in Germany can only be brewed with water, hops and barley. It prohibited the use of wheat and rye, so they could be used for bread making, but it also made sure that German beer was all made to the same quality standards. Even today, Germany is well known for producing top quality beers because of this law. In terms of flavour, Hops play a big part in most beer styles. A lot like grapes in winemaking, hops have different flavour profiles depending on where in the world they are grown. English hops can give the beer an earthy, or spicy flavour, whereas hops from Central Europe provide more floral and peppery flavours. New Zealand hops give beers a more tropical flavour, such as pineapple, passionfruit, mango and lychee, whilst American hops are more citrusy like grapefruit and bitter orange. The hops that grow in these regions also have their own individual flavours and qualities, varying in intensity. In the fashion industry, there are often particular cities that are well known for their fashion. Traditionally Paris, Milan, London and New York were known as the big fashion capitals and have often lead the way in world fashion trends - each contributing something different. Paris, known for its classical style and fashion houses Dior and Chanel produced Couture clothing; and later, Yves Saint Laurent introduced “ready-to-wear” collections. Milan was known for being producing slightly sexier, edgier and slightly more affordable collections from fashion houses Dolce and Gabbana, Gucci and Prada. New York became the first to hold a ‘Fashion Week’ to buck the trend of French couture and start producing items like sportswear. This was something that both Paris and Milan had not yet seen. London’s impact on the fashion industry came in the sixties and seventies, with Twiggy becoming the first iconic model and the rise of the Punk era when designer Vivienne Westwood was at the forefront of fashion with her tartan prints and distressed clothing. What’s fashion got to do with beer? Collaborations have been a huge part of the fashion and beer industries. Siren brewery started The Rainbow Project back in 2013. They paired with seven brewers from the UK and gave each of them a colour of the rainbow to loosely base a beer around. In 2014, they decided to pair each brewery with one from Europe. Last year, they paired the seven English breweries with seven American breweries, including; Beavertown (UK) with Dogfish Head (US), Magic Rock (UK) with Cigar City (US) and Partizan (UK) with Prairie (US). Collaborations like these allow brewers to work together and pass on knowledge and experience to other brewers. It also allows these breweries to get their names and products known to consumers overseas. This is similar for fashion designers and the high street. Many fashion followers cannot afford high-end designer prices. To appeal to a wider market, designers have collaborated with high street stores. H&M has worked with designers like Matthew Williamson, Karl Lagerfield, Jimmy Choo, and Alexander Wang, whilst sports brand Addidas have collaborated with designers such as Jeremy Scott, Yohji Yamamoto and Stella McCartney. Collaborations don’t have to be limited to people in the same industry. Pop culture and art have a place in both the brewing and fashion industry. Musicians Kanye West and Run DMC have collaborated with Adidas, and M.I.A with Versace. In 1987, Becks started their Art Labels, where they had musicians and artists design limited-edition labels for their bottles. This included musicians such as Phoenix, Bloc Party and M.I.A, and artists Tracey Emin and Damian Hirst. When you walk into any off-licence, you’ll notice the beer labels. Just like fashion designers have to make their clothes appealing to customers, breweries need to make their beer stand apart from the rest. Collaborations have helped beer brands become known for their interesting beer labels. You only need to look at the likes of Mikeller and Partizan breweries to see their bright and vibrant labels. Flying Dog, a brewery based in the USA had Ralph Steadman - who used to create artwork for Hunter. S. Thompson - design all the artwork for their beers. Fashion designers have the job of making their clothes appealing to customers, a lot like the breweries need to make their labels appealing. What keeps brewers brewing and designers designing? The only people who drink ales are old men in pubs. The only people who drink cheap lager are football hooligans. Women don’t drink beer. These are common misconceptions or stereotypes that people hold, but this really isn’t the case. After the Prohibition nearly killed off smaller breweries, and big breweries like Coors and Anheuser-Busch were mass-producing poor tasting beer - it wasn’t until the late seventies at Anchor Brewing set a new president for brewers and the started the craft brewing revolution. In the last few years, in Britain especially, craft beer culture has started to take over. It is hard to walk through the trendy parts of some cities without seeing craft beer bars and off-licences popping up next to art galleries and boutique shops selling designer clothes. Walk into any off-licence or supermarket and you now a have a choice of beers from all over the world. Much like wine and food pairing, beer and food tastings are becoming increasingly popular too. People don’t want to settle for the limited beers a pub may have on draught - they want a wider choice of cask, keg, bottles and cans. Just like fashion, there are so many different styles and tastes to choose from. Even for people who may think they don’t like beer, there is something they will enjoy. Do you have a passion for everything beer? Or would love to learn more? Why not sign up to an Ale Tasting Masterclass at one of our sites, hosted by one of our beer gurus and discover more ale tales?